Home > Organic Dubia Roaches? If you consider Dubia roaches fed only certified organic foods “organic” like we do, then yes! NOTE: We combined our “standard” and “organic” Dubia roach pages into a single product page for simplicity. 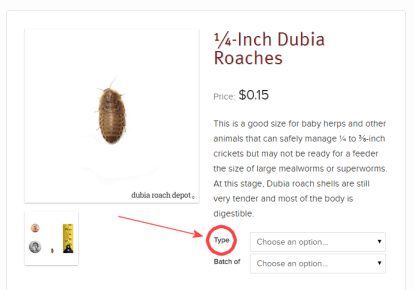 To buy organic Dubia roaches now, visit any product page, click the “Type” drop-down menu, then choose “Organic”. The saying “You are what you eat” isn’t just for people. It’s true for any animal, including the reptiles, amphibians, and arachnids we keep. And it’s true for insects too. What Dubia roaches eat today is what they will become tomorrow. If you want the strongest, most vigorous breeders and the ultimate nutritious feeder, we believe you should feed them pesticide-free, non-GMO grains, fruits, and vegetables. In other words: Organic food. What makes our Dubia roaches “organic”? There are no official guidelines for organic roaches as for common livestock animals like chickens or cows. However, we go well beyond those livestock regulations. They include long lists of exceptions for time, ingredients, and practices that we wouldn’t dream of for our organic roaches. Where they allow exceptions, we make none. Our approach is simple: We feed our organic Dubia roaches only certified organic foods. We also avoid exposing them to man-made chemicals like those in chemical treatments, medications, and cleaners. Simple. If organic rules existed for Dubia roaches, we believe we would exceed them in both spirit and practice. Not always easy…but simple. In addition to feeding only organic foods and avoiding added chemicals, we offer our organic roaches only distilled water. We do this to avoid the 100 or so chemicals in the nation’s drinking water (external link). Pesticides and other synthetic, lab-created substances are a reality in water from snowy mountain peaks (external link) to the ocean floor (external link). We believe there is a direct, positive correlation between Dubia roach health and productivity. We also know that pesticides are often insecticides, chemical companies design insecticides to make bugs not just unhealthy, but dead. Organic also means that we treat our roaches as described not just from the day they’re born, but from the day their parents were born. And this is at a minimum. Our organic colonies are well-established, and the wall of separation between them and non-organic food is many generations deep. We believe this is beneficial because Dubia roaches have a unique ability to store nutrients in their fat cells for long periods of time. This is part of their reproductive strategy, and what they store in those fat cells is passed along to their offspring (external link). In our view, a pesticide-free parent is more likely to give birth to pesticide-free nymphs. And so on down the line. You may have in idea that we’re pretty serious about our organic roaches, and you would be right. We’re so obsessed with keeping our organic roaches chemical-free that we even wash their bins with fresh water only – no soap! Just some rubbing alcohol to kill the germs, fresh water, then out into the air to dry. We have plenty of “bio-friendly” soap that we could probably use, but we choose not to. Why do we go to these lengths for a cockroach? Again the answer is simple: We do it for the health of our animals and for the gains in productivity we believe it provides. These things are probably slightly obsessive, but we don’t mind. It’s what we like to do. Dubia roaches are extraordinarily healthy feeder insects, so why go organic? Aren’t they already healthy enough? Is there any need for organic roaches? Yes and no. Dubia roaches can help captive exotic reptiles, amphibians, and arachnids achieve and maintain good health. Feeding your animals organic Dubia roaches may enhance these effects by avoiding potentially harmful chemicals. These animals lives outside the bounds of what they would experience living naturally in the wild. Their environments are largely artificial. We create their light, day & night cycles, heat, humidity, and food choices based on what we think they need. While the upside for them is that they are free from predation, the downside is that their surroundings are sub-optimal. As a result, they tend to suffer diseases related to captivity. Many or even most amateur herpetologists fail to provide one or more of the conditions their animals need, and these failures have well-established negative health consequences (external link). For this reason, maintaining the health of captive exotic animals is often challenging. We think feeding them insects raised on foods that are as pesticide-free as is possible in modern society can and in some cases should be how we work to meet that difficult challenge. Initially, we switched to organic-fed Dubia roaches because we wanted our early experiments to be meaningful. We thought pesticides, heavy metals, fertilizers, and other harmful substances could be confounding factors in our nutrition and productivity tests. We were raising crickets organically at the time and we wanted accurate data about the effects of switching our animals from mostly crickets to Dubia roaches. After seeing positive changes, we started experimenting with a lot of different organic food ingredients. At some point it made sense to make these roaches available to other animal owners who may want better nutrition from their feeders. And so that’s what we did. Raising and feeding organic Dubia roaches has led to very real (but occasionally hard to quantify) benefits for both the roaches and insectivores. The connection between insect nutrition during development and productivity as adults (external link) is well-studied, and our observations are consistent with the research. And, perhaps more importantly, we have to remember that pesticides kill insects by design. Dubia roaches are insects. This seems like a bad combination to us. Pesticides approved for use on food grown for humans are, by design, deadly for insects. Organic Dubia roaches seem to eat more than their non-organic peers. This could be due to increased breeding, physical activity, fewer harmful substances depressing appetite, increased palatability of organic foods, or other factors. We aren’t sure why it happens, but this is what we’ve seen. The survival rate of Dubia roach nymphs in our organic colonies appears higher than their peers fed a standard diet. We see larger litters in our organic colonies, but there are more nymphs at harvest time than would be explained by larger litters. As far as we can tell, there is either better nymph survival in organic colonies or an increase in production from the adults. As a general concept, we believe organic produce is more nutritious than standard produce (external link). We also believe insect nutrition contributes to growth, longevity, and productivity (external link), and that these are all markers of insect health status. Exotic animals tend to suffer from sporadic good health. They are often fine one day and sick or worse the next. With organic feeders, you don’t have to worry that about pesticide contaminated food. When their health declines, it is far easier to figure out why. You can immediately many causes that relate to bad, poor, or improper diet. And you don’t have to worry about pesticide exposure and chemicals building up over time in animals eating organic feeders. It’s just not an issue. If an animal eating organically does become sick, you can virtually eliminate food contaminants as a potential cause. Feeding organic Dubia roaches offers not just good health, but peace of mind. Are organic Dubia roaches right for you? While we pursue optimum nutrition partly by eliminating man-made chemicals in our roach’s diet, we understand not everyone thinks this is important. And we’re OK with that. There’s nothing wrong with feeding animals non-organic insects and feed. We do it all the time with crickets and mealworms. After making the switch from crickets to Dubia roaches, we stopped breeding other insects. These days we buy secondary feeders from local suppliers and gut-load them before feeding. Changing to a completely organic diet would involve breeding organic crickets and mealworms on top of the Dubia roaches we already have. This would be way too much work. One primary feeder on an 80% organic diet is enough. Whether you should switch to organic feed or not depends on many things. It probably at least in part comes down your situation, your beliefs about feeding organic food to insects, and what you want for either your roaches or your animals. In this regard, necessity is the mother of all invention. Do you have a frail animal desperately in need of help? This is a prime example of a situation that can benefit from organic feeders. It’s not everything, of course. Frail exotic animals may need professional help. A diet won’t cure everything…but we believe it goes a long way to preventing disease and maintaining good health. If you decide to try an organic feeder, we strongly recommend Dubia roaches. And not just because we sell them. We made the switch to Dubia roaches specifically, and to organic feeders generally because we saw the positive effects they had on our animals. It didn’t happen the other way around. In our opinion (and the opinion of many others) Dubia roaches are the healthiest feeder insect available. We think they’re an excellent choice for those who want the finest breeders and feeders for their animals. For us, taking it to the next level with organic Dubia roaches makes sense. Dubia Roach Depot is awesome!